Ullswater England’s most beautiful lake is also England’s second largest lake. At approx 9 miles long and three quarters of a mile wide the lake is a typical narrow ‘ribbon lake’ formed after the last ice age by three separate glaciers. The surrounding fells give Ullswater its stretched Z shape with three distinct reaches. Pooley Bridge an attractive village popular with tourists lies at the very northern end of the lake, whilst Patterdale lies at the very southern end. The eastern lakeshore path from Sandwick in the north to Patterdale in the south was described by Wainwright as the most beautiful and rewarding walk in Lakeland. Ullswater is the setting for William Wordsworth’s famous ‘Daffodils’ poem after he saw daffodils growing on its shores. Whatever the weather or the season Ullswater is a wonderful place with so much to offer whether breathtaking views or outdoor activities. Martindale is a beautiful valley that lies on the east side of Ullswater. Completely unspoilt this quiet valley even in the summer is reached by a mountain pass that ascends from Howtown. Martindale within the Lake District National Park runs for about 5½ miles. The foot of the valley is located at the small hamlet of Sandwick while its head is situated on the slopes of Rampsgill Head where the headwaters of Howegrain Beck rise at a height of around 700 metres. The upper part of the valley is divided into two sub valleys, Bannerdale and Rampsgill, by the fell of The Nab. 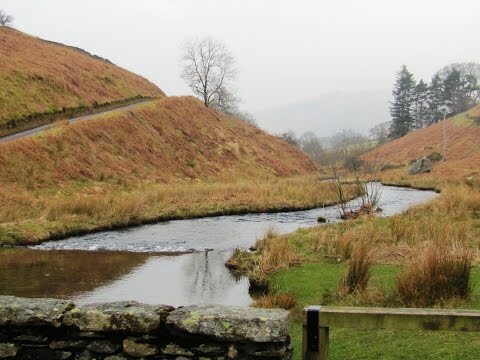 The becks of Bannerdale and Rampsgill meet halfway down Martindale to form Howegrain Beck which then becomes the main water course for the lower part of Martindale. It then enters Ullswater at Sandwick near where Martindale is joined by the side valley of Boredale. The lower area of Martindale where the mountain pass comes over from Howtown is the main area where there is House Farm, The Old Reading Room and a few self-catering cottages. St Peter’s Church, dating from 1880, often referred to as the New Church is situated at the top of the pass. A little further up the valley is the restored St Martin’s Church often referred to as the Old Church has existed since at least 1220, the present building dating from the end of the 16th century. There have been many restorations but the last major restoration was in 1882 when the roof was replaced. Violent storms destroyed the roof on the day that the new church of St Peter was consecrated. It is now a Grade II listed building and only used occasionally. Objects of interest include the 1634 reading desk, the font is believed to be part of a Roman alter, the church bell which is 500 years old and the yew tree in the church yard is estimated to be about 1300 years old. The church is frequently visited by passing hill walkers and tourists. Half a dozen farm buildings occupy the mid and upper parts of the valley. Martindale’s wildlife includes red squirrels, badgers, hares, herons, woodpeckers, owls, falcons and the local herdwick sheep can be seen everywhere in the fields or on the open fells. The upper part of Martindale around The Nab is a deer reserve which is not open to the public and contains no rights of way but due to the Countryside and Rights of Way Act 2000 The Nab is now open access and walkers are requested to keep to the preferred routes which avoid the herds when climbing The Nab. The reserve is home to the oldest native red deer herd in England. At the foot of The Nab is “The Bungalow” which is a former shooting lodge built in 1910 by Hugh Lowther 5th Earl of Lonsdale for a deer shooting visit by the German Emperor Wilhelm II in the same year. The Bungalow is now used as a self-catering accommodation which houses 12 people. The walk along the High Street ridge or a walk through the valley of Bannerdale could well reward you with sightings of these beautiful red deer or even a golden eagle. Beda Fell which rises to 509 metres (1,670 feet) divides the valleys of Boredale and Bannerdale. The southern boundary of Martindale is formed by a long ridge running from Rampsgill Head to Place Fell. Spurs run north from here to separate the individual valleys and Beda Fell is one of these. From the north of Martindale Beda Fell rises quite steeply over crags on a narrow ridge to Beda Head the summit of the fell. Beda Head, which is much wider, is a grassy mound with a small cairn where there are wonderful views of the surrounding high fells, but the wideness of the ridge hides much of the valleys below. Looking north Ullswater is visible either side of Hallin Fell. Beda Fell then descends over Bedafell Knott and a series of rocky knolls on a narrowing ridge before ending at the ascent to Angletarn Pikes its parent fell. The ridge path near Bedafell Knott is crossed by a bridleway from Patterdale via Boredale Hause to the end of the Bannerdale road at Dale Head Farm. We cross the bridge near Hause Farm and take the path opposite following the wall. At the end of the wall we turn right along the track to meet the road. We then turn immediate left very steeply uphill with the wall on our left towards a lone tree. We head forwards between two walls then as it opens up we turn left following tight to the wall on the left uphill. At the brow we turn right steeply uphill on a faint path. We keep heading forwards following the path uphill passing a cairn and then a seat. We head forwards up and down over the crags to a cairn. We keep following the path and cross over some boggy ground then continue forward to the next cairn on Beda Head the summit. We keep following the path along the ridge towards the valley heads in front. After passing over some grassy hummocks we climb over Bedafell Knott and keep heading forwards to a crossroads of paths and a small cairn. We turn left and follow the sunken path downhill. We go through a wall and head towards the farm, Dale Head. We go through the gate on the right of the farm and walk between the buildings. We pick up the farm lane and follow the lane for just over a mile. We cross over a bridge and walk past St Martin’s Church and keep following the road back to Hause Farm and the bridge where we parked. This is a moderate walk on paths, tracks and lanes. There is a long ridge and some steep rough inclines and declines. Approx 5.3 miles allow 2¾ hours using OS Explorer Map 5. The English Lakes, North Eastern area. Start Point: Bridge over Howegrain Beck near Hause Farm, Martindale. Martindale is situated between the lakes of Ullswater and Haweswater in the Lake District, Cumbria. From the A66 just after the M6 roundabout take the A592 sign posted Ullswater and Windermere. At the t-junction turn left to Pooley Bridge. Go through the traffic lights and then turn left immediately after the church. At the crossroads turn right and follow this road to Howtown. Continue forward on the small road going up a steep mountain pass, with leg bends, to the top. Continue forward past the church of St Peter then head downhill to Howegrain Beck and Hause Farm. Parking: limited off road parking near the bridge. No car park. There are no public toilets the nearest ones are at Pooley Bridge. For refreshments the nearest pub is the Howtown Hotel but there are shops and three pubs in Pooley Bridge.